Here's the funny thing about movies and TV shows where you see the couple at the altar exchanging rings, or when the guy gets down on one knee and slides a ring on his new fiancée's finger: They never show the process up to that moment. How did they settle on the size or the width? Who picked out the profile and the design? Why did they select the material that they chose? How did they decide on the finish? Did they browse first or do any comparison shopping? Contrary to what television would have you believe, these questions don't just answer themselves. It might not be as glamorous as two people on a beach with a dramatic breeze and a perfect ring that somehow magically appears, but figuring out these details is literally what makes your wedding rings work for you. Step 1: First, figure out your ring size. Technically, you don't need to do this step until the end, but it's easier if you get this out of the way first. If you already know your ring size, great, skip ahead to the next heading. Otherwise, bear with us for a minute. If you don't know your ring size, then whatever you do, don't guess. Get an answer. There are multiple ways to do this, but the easiest is to just go to a jeweler (preferably two or three of them) and ask to be sized. Sizes can vary by jeweler and even by time of day (your finger is always expanding and contracting), so the more places you get sizes from at different times, the more accurate and certain you can be. If you notice some variation, then try to get sizes from two or three more jewelers and take an average. Our advice: If you've got a mall nearby, pick a day and stop by the jewelry counters of all the department stores and ask whoever is working if they can size you. Most places will do it for you in moments with no hassle. For more in-depth coverage of how ring sizes work and how your own ring size can change, check out this article we wrote on the subject. Step 2: Select a material for your ring. You may think that the design is the logical place to start, but really it's better to get an idea of the type of material you want in your wedding ring first. 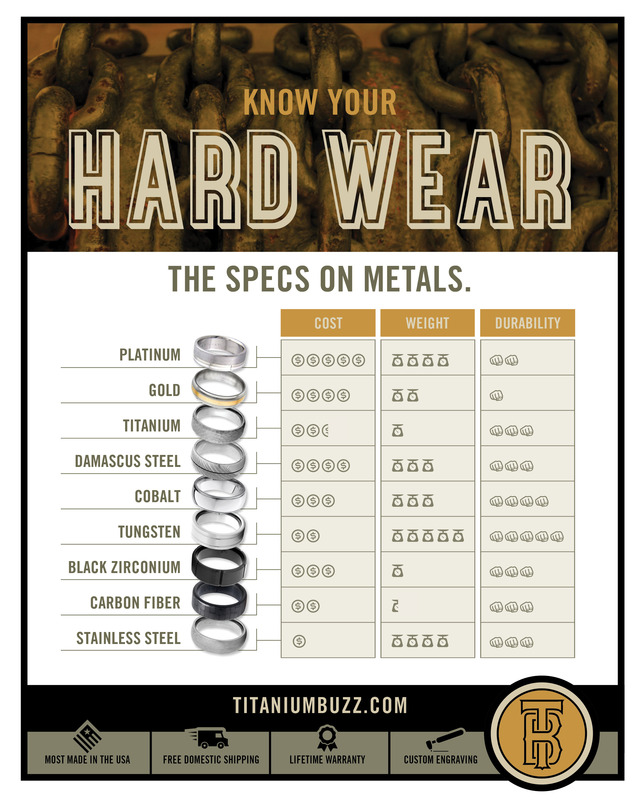 The material, usually a metal, is the basis for your entire ring, and it determines everything from how it will look, to how it will feel, to how long it will last. 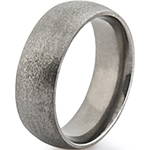 There are more material choices for rings than ever these days, but our favorites -- and the ones most frequently featured in our store -- are titanium, black zirconium, cobalt chrome, Damascus steel, and carbon fiber. All are incredibly durable, all are incredibly comfortable, and all come loaded with a lot of amazing qualities. So which metal should I select? Titanium - Sleek, silvery, and lightweight. 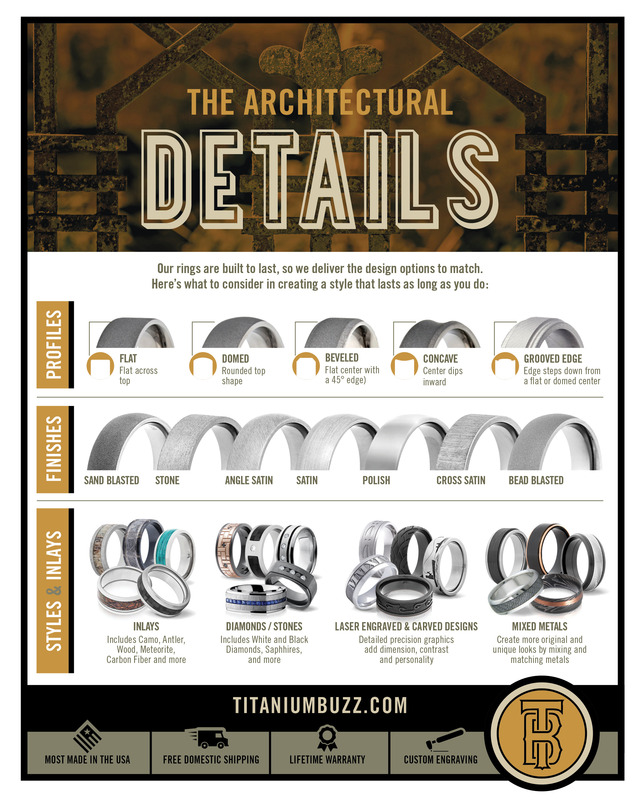 Choose titanium for a versatile ring that looks similar to silver, only way more awesome. Cobalt Chrome - Brighter and stronger. Choose a cobalt chrome ring for a brilliant surface that even outshines platinum. Damascus Steel - Mythical and mesmerizing. 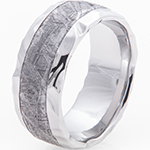 Choose a Damascus steel ring for stunning textures and patterns. Black Zirconium - Black and bold. 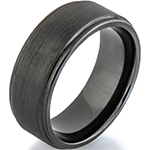 Choose a black zirconium ring for something that breaks tradition and looks great doing it. Carbon Fiber - Cool, classy, completely different. It's lighter than steel but a whole lot stronger; unique twill patterns set CF rings apart. Once you've got the material you want in mind, the real adventure begins. Wait! What about traditional metals like gold and silver? What about platinum? First, you can find them almost anywhere, and our goal is to bring you the best of the uncommon. Second, with the exception of platinum, many traditional metals are much easier to damage and don't hold up as well to wear. Gold, for instance, is notoriously unreliable. Our philosophy is, if you're going to be wearing a ring for the rest of your life, then it should last a lifetime. Third, the price points on these materials tend to be much higher than what we think is right, or fair, for wedding rings. We do, however, offer a few select choices in some of these metals and we also enjoy working with them. If you see a design on our website that you like, but don't see it offered in the metal you want, let us know. We can produce the ring for you in the metal of your choice. Step 3: Now it's time to pick the design. It's time to choose the design you want. This is where nothing but your personal preference matters, and out here the only wrong choice is one that doesn't fit your personal sense of style. Don't get us wrong, we love style. We built our entire business on creating styles that other jewelers don't have. Certainly, some designs get popular for a reason, and our ring designers are constantly working hard to come up with the next runaway great look. 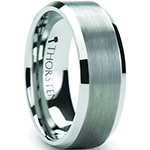 But all styles of wedding rings should, 100% of the time, be a reflection of the wearer and not the other way around. The best rings are always the ones that speak to you, not the ones that everyone else are wearing. Sure, you can go with whatever some actor or paid spokesperson says that you should like, or you can stand up and be unique and start your own personal brand -- and look great doing it. Personalization is where it's at. 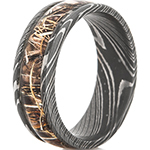 Camo Rings - Our all-time bestselling rings. We don't just offer this style, we invented it. 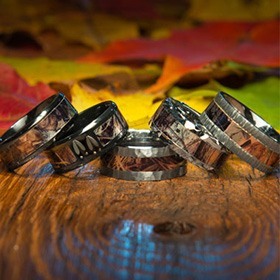 If you love hunting or the outdoors, then this is the first place you'll want to search for your wedding ring. 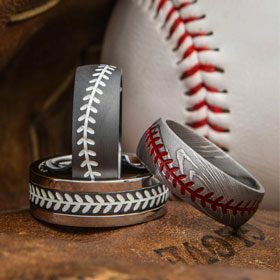 Sports Rings - If you love the game, whichever game that might be, then be a hero and check out these one-of-a-kind designs that put your passion right at your fingertips. Baseball, basketball, football, hockey, soccer, and more -- they're all here. 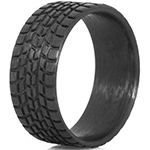 Tread Rings - Everyone said we couldn't do ring designs based on tires. Everyone was wrong. Whether you consider yourself a biker, a bogger, a gearhead, or just someone who values high-performance quality, then these bestsellers are for you. Meteorite Rings - What's cooler than a wedding ring made with a four-billion-year-old piece of stone? Nothing. The spectacular and infinitely unique patterns on our real meteorite inlays will prove that you don't have to be a science nerd to fall in love with these relics from space. 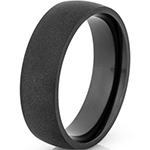 Flat Black Rings - In many ways, the rings in our Midnight Matte Collection are the exact opposite of what you would expect from a wedding band, and maybe that's what makes these light-devouring masterpieces a continual customer favorite. Don't feel limited. We have dozens of collections and literally hundreds of designs to choose from, so we can promise that we have a ring that's right for you. We also do custom designs, so if you have any questions, ideas, or just want some style advice, call our experts at 1-866-215-1861 or send us an email. We both like very different designs. What should we do? There is a popular school of thought that says sets of wedding rings should match and mirror each other. There's nothing wrong with that reasoning, and many of the couples we have worked with over the years, including members of our staff, have happily chosen to go with matching wedding ring sets. Consider connecting rather than mirroring your wedding rings. 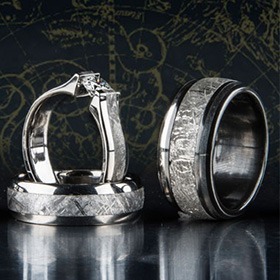 But for those couples who have different tastes, there's another school of thought that recommends connecting your wedding rings by a common trait or thread. What we mean is that you can each have a different ring, but those rings should both have a feature in common, a bond to unite them. 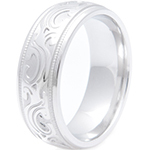 For example, you can each pick a different design but keep the metal of both rings the same. Or you can choose different metals but keep the same design. Or you can each pick different metals as well as different designs but keep the overall "theme" of both rings the same. 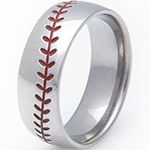 We see this all the time in our collection of camo rings, by the way. 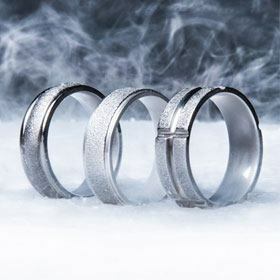 The connection between the two rings may be obvious, or it may not be so obvious, but the important thing is that you and your spouse or future spouse choose them together. Do that, and the possibilities for each of you are limitless. Step 4: Pick a shape for your ring. There are a lot of different names for ring shapes and even more for variations of shapes, so things can get confusing pretty quickly. When you factor in that some of the names are subjective, vary by country or region, or are just straight invented by a particular jeweler, you can quickly fall down a rabbit hole of contradictory blog posts and online debates and not emerge with any better of an understanding than when you started. How do I settle on a shape, then? Dome Profile - Called "D-shape" in some circles, this is a rounded profile that most closely resembles what a lot of people think of when they think of a "traditional" ring. Many rings in this style are done in a "comfort fit," which means the bottoms and insides are rounded to fit more easily on the finger. Flat Profile - The name is, well, pretty self-explanatory. Flat profile rings are flattened at the top. Flat rings tend to look a little more modern and are prized for their clean lines. The edges tend to be flat as well but can also be beveled or raised. 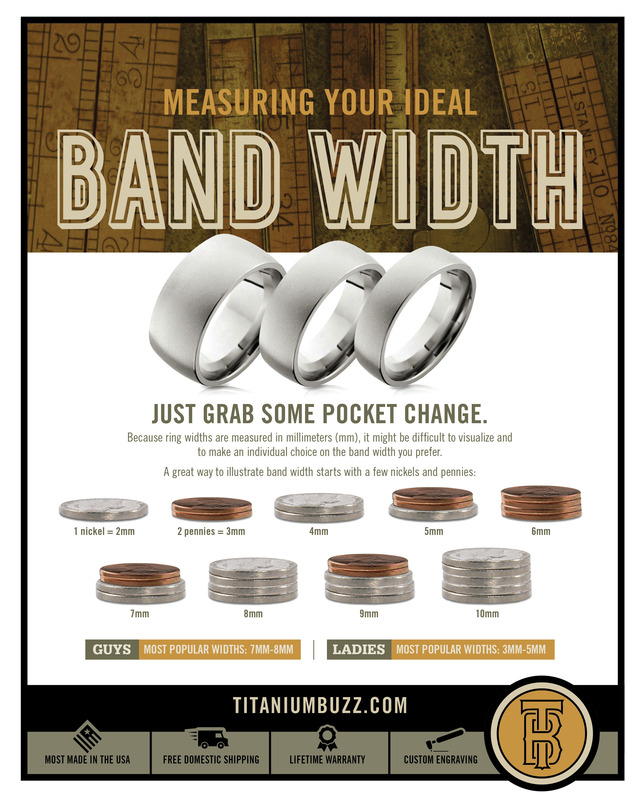 Flat profile rings come in all shapes and sizes but tend to look really good at larger widths. Concave Profile - Sometimes called "scooped" or "beveled," concave profile rings are the inverse of dome rings, with raised edges and a sunken center. While often a feature of more exotic and wild rings, the graceful curves of a concave profile can pull off a perfect fusion of classic and modern. There are many minor variations and even combinations of these shapes out there, but if you just keep these three basics in mind you shouldn't have any trouble finding something that works for you. Step 5: Choose the width of your ring. This is one of those things that no one ever thinks about until the last second, when suddenly you're supposed to know, down to three hundredths of an inch, how wide you want your ring to be. Keep in mind that when we talk about ring widths we're talking about the distance in a straight line from the left side to the right side of the ring. This is not the same thing as thickness, which is the distance from where the ring touches your finger to the top of the ring. Most rings have a set thickness, so in general you won't need to worry about this part. Here's an easy way to visualize ring width. Stacking two nickels together, for instance, will show you what a 4mm wide ring will look like. It will also give you 10 cents. Is this 100% accurate? Technically, no. For example, a 9mm ring will actually be .14mm thicker than five quarters stacked together. Also, older coins might be .1 or .2mm narrower than newer ones due to wear. But if your eyes are sharp enough to spot a difference that small, then we'd like to ask where you got your superpowers. For the rest of us mortals, the approximations are close enough to give a very good sense of how wide your ring will be. Bonus: A 2mm-wide ring is the same thickness as a single nickel, while a 3mm wide ring is the same width as two pennies. Step 6: Don't forget about the finish. If you've made it this far, you're in the home stretch and are on the cusp of having your ring picked out. There's just one more major decision you have to make: What kind of finish do you want applied to your ring? 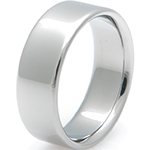 Polished - Always a favorite, a polished finish is sleek, shiny, and brings out the full brilliance of the metal. Think polished silverware. Brushed Finishes - A uni-directional polish that showcases lines in the metal. Think brushed steel. Satin Finishes - A cross between a brushed and matte finish. Not brilliant, not dull, but always on the subtle side. Think semi-gloss paint. Variations include angle satin (finish is 45 degrees to circumference) and cross satin (finish is perpendicular to circumference). Matte or Flat Finishes - A dull, unpolished look that creates more of a solid color in the absence of glare. Think matting around a framed photo. Matte finishes tend to value texture over reflectivity. Variations include sandblasted and bead blasted, which can feel like extremely fine sandpaper. Stone Finishes - Available on select styles. A rougher finish with a more dramatic texture. In addition to standard stone finishes, variations include our frost finish and the ultra-rugged rock finish. More traditional styles or metal rings with very little ornamentation, such as plain titanium or cobalt chrome rings, often look best with a polished finish, while more elaborate styles, such as many of our black rings, work better with a satin or matte finish. As always, it's going to come down to your own sense of what works for you. Step 7: Last, decide what engraving you want. What do we mean by engraving? 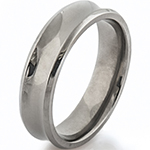 Most of our rings are available with optional personalized inscriptions etched on the inside surface of the band. Most people choose to engrave a wedding or anniversary date, but you have room to be inventive. Here are some of the more creative wedding ring engraving ideas we've seen over the years. When ordering, be very sure that you've written out your inscription exactly the way you want it to appear on your ring. There has never been a better time in your life for you to double check your spelling than this moment. What do you mean "most" rings can be engraved? Some rings can't be engraved. We're not saying that to be jerks; it's just a fact of life. 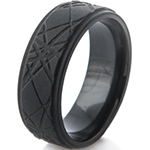 Some styles, such as our 100% carbon fiber rings, are made out of materials that are impossible to engrave. Other styles, like very narrow rings in the 2mm to 3mm width range, are simply too small -- even if we could manage it, you wouldn't be able to read the inscription anyway. Can some rings be engraved on the outside of the band? Some of our rings also include personalized engraving of some kind or another on the outside of the band. Our ridiculously popular duck band rings are perfect examples of these. Whenever a ring includes this kind of engraving, it will be clearly noted in the description of that item. You'll also notice it on the picture of the item -- rings with these options tend to be hard to miss. As always, if you've got questions about any of this, we've got answers. Give us a call at 1-866-215-1861 or send us an email if you hate talking on the phone. Bonus: How soon should you start looking for your wedding rings? Not three months beforehand, not six months, right freaking now. In fact, use "now" as a watchword for all of your wedding planning. If you ever find yourself wondering when you should start doing something to get ready for your big day, even if your wedding is a no-frills affair scheduled five years in the future, the answer is almost always "today." Trust us on this. Even if you never buy anything from us, even if you never visit this website again, please do not put off any part of your wedding planning. Do as much preparation as you can, as soon as you can. The good news is, if you're reading this then you're already well on your way to figuring out your wedding rings. The other good news is that we are sensitive to wedding and anniversary dates and understand how life can spring deadlines on you at the last minute. All of our rings our custom-made and there will always be a production timeline associated with them, but we are very good at meeting tight deadlines and expediting orders. If you're concerned that your ring won't be finished in time, tell us about it as soon as possible and we'll see what we can do. Congratulations! You are now ready. Seriously, good work. It can be a lot of information to digest, but once you've got the basics down you'll be able to shop for your wedding rings anywhere -- not just here -- and navigate the ins and outs like a pro. Don't let yourself be intimidated, and especially don't let some seller intimidate you. Pick a budget, stick to it, think about what you like, and get out there and start shopping. The choices you make will be perfect.